This piece represents my evolving understanding of marriage in light of the Bahá’í writings. 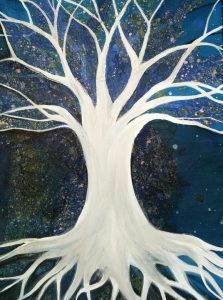 The tree is strong, earthy, and grounded, set against a cosmic background, and there is a sense that the roots and branches extend eternally, part of a timeless process and dimension beyond its own individual existence. “The true marriage of Bahá’ís is this, . . . that they may . . . enjoy everlasting unity throughout all the worlds of God. The act of creating the piece was an apropos learning experience for, though I had all the materials and a vision for what I wanted to make, it still took longer and went through more evolutions than I expected. It is a balance of clear-headed preparation (which I could have done more of) as well as allowing the art, the process itself to guide, let it be what it wants to be, not what is imposed upon it. I also consider this piece still unfinished, which I feel is also a fitting reflection of where I am in my understanding of the topic. The painting is as yet unnamed. I welcome title suggestions!